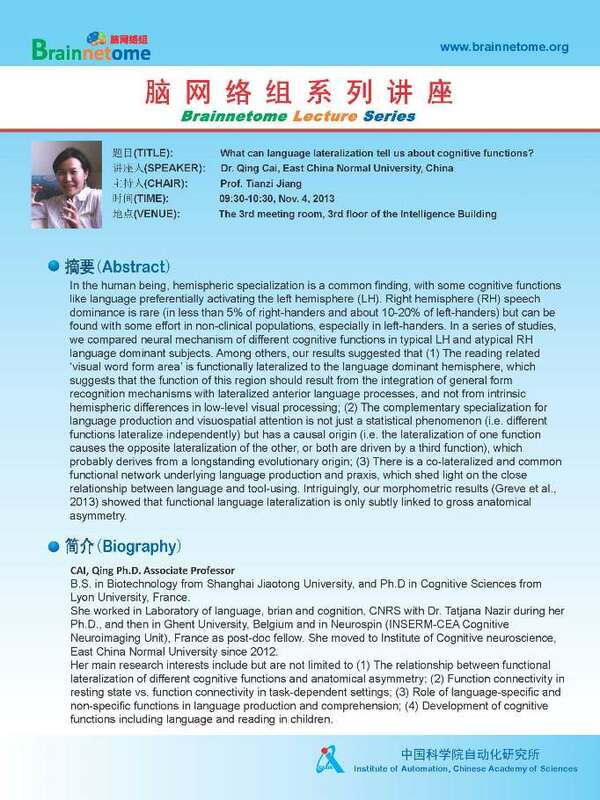 Prof. Cai's Lecture -- What can language lateralization tell us about cognitive functions? Title: What can language lateralization tell us about cognitive functions? In the human being, hemispheric specialization is a common finding, with some cognitive functions like language preferentially activating the left hemisphere (LH). Right hemisphere (RH) speech dominance is rare (in less than 5% of right-handers and about 10-20% of left-handers) but can be found with some effort in non-clinical populations, especially in left-handers. In a series of studies, we compared neural mechanism of different cognitive functions in typical LH and atypical RH language dominant subjects. Among others, our results suggested that (1) The reading related ‘visual word form area’ is functionally lateralized to the language dominant hemisphere, which suggests that the function of this region should result from the integration of general form recognition mechanisms with lateralized anterior language processes, and not from intrinsic hemispheric differences in low-level visual processing; (2) The complementary specialization for language production and visuospatial attention is not just a statistical phenomenon (i.e. different functions lateralize independently) but has a causal origin (i.e. the lateralization of one function causes the opposite lateralization of the other, or both are driven by a third function), which probably derives from a longstanding evolutionary origin; (3) There is a co-lateralized and common functional network underlying language production and praxis, which shed light on the close relationship between language and tool-using. Intriguingly, our morphometric results (Greve et al., 2013) showed that functional language lateralization is only subtly linked to gross anatomical asymmetry.